NBC: THE VOICE gained 0.1 to 1.9. It was followed by the season premiere of BETTER LATE THAN NEVER at a quiet 1.1, although that was 0.2 better than last week’s episode of THE WALL. ABC: The network had NFL preemptions in both Boston and Miami, so afternoon adjustments are likely. 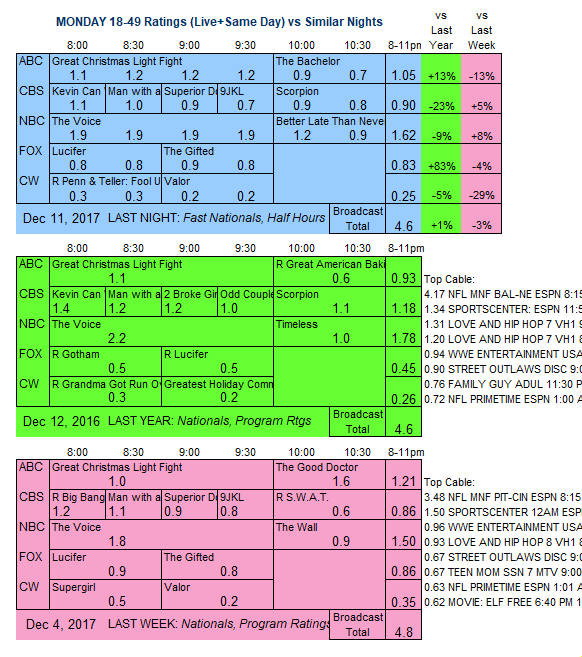 Currently, THE GREAT CHRISTMAS LIGHT FIGHT is at 1.2 and THE BACHELOR preview hour is at 0.8. CBS: KEVIN CAN WAIT returned from a week off down 0.1 to 1.1. MAN WITH A PLAN fell 0.1 from last week to 1.0, SUPERIOR DONUTS held at 0.9, and 9JKL dropped 0.1 to 0.7. SCORPION was also back from an off week, steady at 0.9. 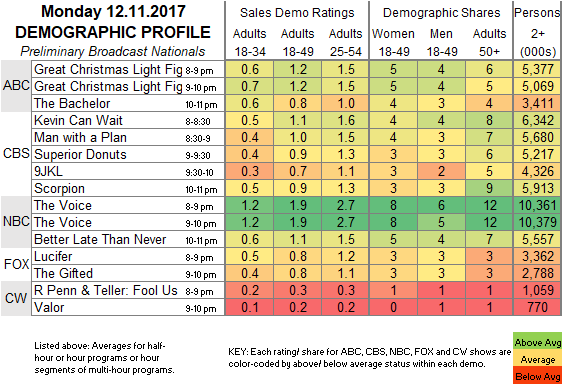 FOX: LUCIFER’s midseason finale dropped 0.1 to 0.8, and THE GIFTED’s remained at 0.8. CW: After an 0.3 rerun of PENN & TELLER: FOOL US, VALOR stayed at 0.2. NBC has tonight’s holiday special, GWEN STEFANI’S YOU MAKE IT FEEL LIKE CHRISTMAS.